Moriah Farms is also the home of Lankford’s herd sire Leonidas – a 1998 son of Coach and W5 Flower Garden. Lankford bought Leonidas via private treaty in 2003 from Red McCombs in Johnson City, Texas. As the senior herd sire, he currently services Lankford's main cow herd. Besides being a direct son of Coach, Leonidas is also a grandson of Don Juan of Christine and Miss Redmac 256. Leonidas’ dam, W5 Flower Garden bred by Frank Anderson, Jr, is a granddaughter of the famous Monarch 103. SCC Pumpkin Pie sold for $24,000 at the 2004 Butler Breeders Sale. Miss Redmac 185 sold for $18,000 at the 2005 Red McCombs Bull Bonanza. FA Red Shoulders sold for $12,500 at the Legacy Sale II in 2006. After 34 years in the oil industry in west Texas, Lankford began looking at Longhorns for their distinct traditional look. He joined the TLBAA as Lifetime Member in 1991 and began his breeding program with seven heifers and a bull bought from the YO Ranch. 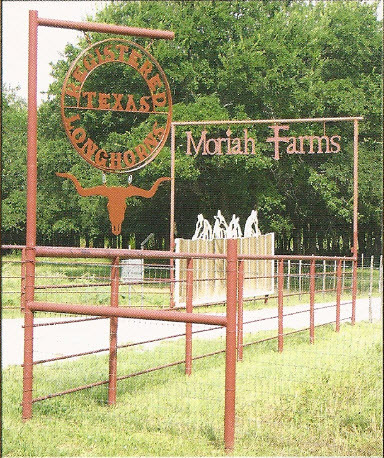 After buying land in Kerrville, Texas, Texas Longhorns from the YO Ranch were a natural choice. 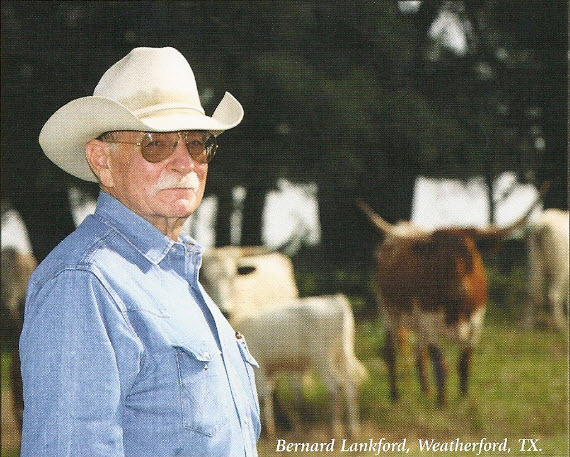 At the time Lankford was still living in Midland, Texas, and working as a petroleum engineer, so the Longhorns ability to look after themselves was the prime reason for Lankford to invest in the breed. At first he had his Longhorns because of the characteristics that helped them survive in the wild, “I liked them. I knew that Longhorns were real hardy and could get along on their own,” Lankford said. Despite some speculation, Lankford didn’t pick Longhorns because he is an alumnus of the University of Texas (1961). He is also a former owner of a minor league baseball team in Midland as well as various other businesses. In ’95 he semi-retired from the oil industry and began raising and breeding his Longhorn cattle full-time. “Once I began raising Longhorns and spending time around then,” Lankford said. “I realized how unique this breed was.” What he learned – similar to what most Longhorn breeders realize during their first few years – Longhorns quickly became a passion. His wife, Bette, is an avid Horse woman. She competes in three day eventing – a Dressage, Cross country Jumping and Stadium Jumping competition. Lankford employs one ranch hand, Alfredo (Freddy) Olivo, who lives at Moriah Farms with his wife and four children. Freddy would be considered a Top Hand by anyone and is a real blessing to Moriah Farms. “He’s freed me up to spend more time with the cows,” Lankford said. One thing that Lankford believes is a priority is pasture management. He pays very close attention to the grasses by using soil analysis in order to provide good natural nutrition for his Longhorns. The agents assisted him in deciding the right strategies to make his pastures produce and provide the right kind of nutrition for his Longhorns. Lankford says he has paid special attention to fertilizer, feeding supplement and minerals. He recommends every Longhorn breeder make use of their local county extension agents. “If they don’t have the answer, they can point you to someone who does. The only problem is they’re Aggies,” Lankford laughs. Overall Lankford doesn’t focus his breeding program toward a particular trait. He enjoys his cattle; he loves seeing them grow and become the beautiful animals they have always been and enjoys breeding a complete Longhorn. “I like the traditional stuff,” Lankford said. A tradition he would agree spans longer than any one man.